The Formtech E1 concept vehicle. Formtech, with locations in Germany and the UK, specialises in the development of metallic components and composite structures for the motorsports and automotive sectors. Formtech’s EV started out as a concept for the company's CEO Franz Hilmer. 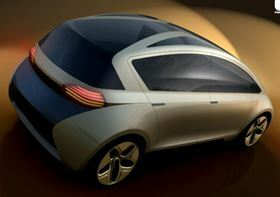 “The chosen concept of the E1 came from the idea that a secondary car; where the customer already owns a vehicle, and considering an eco-friendly alternative especially designed for short commute, with the capacity to carry 4 passengers, should be simple and take full advantage of the electric drive train," explains Nakamura. The Formtech E1 forms the basis of further development studies by Formtech into the area of EVs.